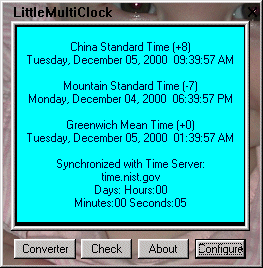 LittleMultiClock is an intuitive application to automaticly synchronize your time clock with one of the U.S. atomic time clocks and it provides useful tools and options. These tools and options include: Customization of which time servers to check. Software runs hidden in the taskbar. Automaticly update time when you connect to the internet, or at any specified interval. +- seconds tolerance for margin of error. Check time manually. Your computer will update automaticly, ask for permission to update, or not update. Will inform you of the amount of time off. Will track a selected foriegn time, your local time, and Greenwich mean time. Find world times and their respective local time on demand. Powerful time zone editor. Easily convert time with the time converter using select boxes. Great look. Determine U.S. Daylight Savings Time.